Salvation And Survival: Is The TSA Pre-Check Another Information Grab? And Is It Safe? Is The TSA Pre-Check Another Information Grab? And Is It Safe? I recently had a good friend fly in from Arizona for a long weekend visit. As she traversed airports, she was surprised to be told by a TSA agent that she could skip the long, slow security line because she had a Pre-Check board pass. What was that, she asked. He explained that she did not have to remove her shoes, her belt, her jacket, her laptop from its bag, or show her bag of liquid containers. That's great, she thought, but how did I come to be eligible for this program? I don't remember signing up for anything. We figured that because she is a member of a Frequent Flyers program for US Airways, she was automatically enrolled in the program. But our first thoughts were, how safe is that? Aren't all those items the exact things that we've been warned about that could be used to conceal methods of terrorism? So we decided to figure out how one enrolls in this unfamiliar program. The official TSA website describes this program as "an expedited screening program that allows travelers to leave on their shoes, light outerwear and belt, keep their laptop in its case and their 3-1-1 compliant liquids/gels bag in a carry-on, in select screening lanes. To date, passengers have only been eligible through existing programs such as U.S. Custom and Border Protection’s Global Entry program and frequent flier programs with certain airlines, but this announcement will allow travelers to apply directly for the expedited screening program. 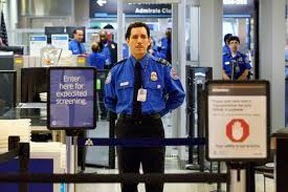 Since its introduction, more than 25 million passengers have already used TSA Pre✓™ nationwide." So, for me, there's an obvious concern ... of those 25 million passengers, how many are like my friend, who didn't even know they had been signed up? She underwent no special evaluation, other than she has enough points on her credit card to use toward airline miles. How quick before someone with nefarious plans takes advantage of that? Does it seem like a loophole to anyone other than me? Am I not understanding this program? On further investigation, I discovered that, according to the TSA website, the way to enroll in the program is as follows: "The TSA Pre✓™ application process allows U.S. citizens to go through a pre-enrollment process online and visit an application center to provide biographic information (e.g. name, date of birth, address, etc. ), fingerprints, payment and valid required identity and citizenship/immigration documentation. All TSA Pre✓™ program applicants must visit an application center in-person to verify their identity and citizenship/immigration status as well as to provide fingerprints." That's all well and good; they have to be a U.S. citizen to apply. But what about the issue of home-grown terrorists? How many times have we heard about people who have no history of association with terrorist groups; no criminal record, and then we find out they are at the center of a sinister plot? And are there any exceptions to applying, such as individuals on student visas, or those who could hide behind medical complications? It seems to me that this program affords someone seeking to harm that plane greater probability of achieving his mission. And that possibility far outweighs the advantages of boarding the plane quicker and easier. But that's just me. Could it be that this is just another information grab and data collection service? Why does it seem so contradictory to me? On the one hand, the program gathers uniquely personal information about you, and then on the other hand, you are allowed to bypass all the security measures we were told are necessary to keep us safe. Granted, if it was a perfect world, then the data they are collecting on each of the participants should go a long way towards keeping the bad guys off the planes. But it seems to me that all that data would be helpful in identifying them after the crime. Plus let's not forget that there is an $85/5-year membership fee that must be paid to stay current in the program. To date, that's a tidy little sum of over $2 trillion every 5 years for the TSA; and the program is expected to grow exponentially as the application sites open nationwide. So, here's what I'm thinking: Perhaps the TSA is tired of hearing the grumbling from passengers about the long security lines, and their invasive screening techniques. So now they have initiated a new program that will supposedly result in happier passengers; but will they be safer passengers? You can't really have it both ways! And I just can't help myself; when it comes to a government agency, I'm always skeptical... aren't you? 1 Timothy 4:16 "Keep a close watch on yourself and on the teaching. Persist in this, for by so doing you will save both yourself and your hearers." To me, the TSA is nothing about safety and all about indoctrination and control. IF America had the political will to run airport security the same way Israel does (been through it and still appreciate it) - by checking backgrounds, highlighting passengers who deviate from normal patterns, and interacting with passengers with trained, psychologically educated agents - we would be much safer and far less inconvenienced. But TSA is also about politically correct indoctrination. I've seen older ladies "screened" for additional searches so TSA can maintain it's "Random" search patterns. TSA is just another way that Big Government trains Americans to give up their freedoms, rights and individuality. Disagree with a TSA "agent"? -- miss your flight and get strip searched. And TSA makes sure you KNOW that. So next time any government official asks you to do something...well, you're already in the habit of just doing as you're told. I always appreciate your educated and informative comments! I just see nothing but additional data mining and psychological manipulation in this new TSA initiative. But I'm sure there are many who will see nothing wrong with trading their privacy for the "convenience".